The blue-green foliage forms nice low mats. The semi-double pink flowers have a darker crimson band and are strongly scented. Great choice for rock gardens. 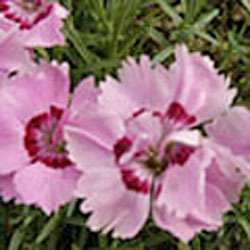 Categories: All Items, all potted plants, common names c-g, More..